Transparency Market Research states that the competition in the global minimally invasive surgery market is quite fragmented due to presence of several players. However, the research report picks Varian Medical Systems Inc., Stryker Corporation, Teleflex Inc., NuVasive Inc., Siemens Healthcare, and Given Imaging Ltd as some of the leading players operating in the global market for minimally invasive surgery. To stay ahead of the competition, players are expected to focus on expanding their product portfolios and investing in research and development. Introduction of surgical robots is expected to help the companies tackle competition and make their market during the forecast period. According to the research report, the global minimally invasive surgery market is expected to be worth US$50.60 bn by the end of 2019. During the forecast years of 2013 and 2019, the global market is expected to register a CAGR of 10.5%. Out of these various devices, the surgical devices segment, which includes medical robotic systems, electrosurgical devices, and ablation devices, is expected to dominate the global market during the forecast years. In terms of geography, North America is expected to show a strong presence in the global market due to a robust healthcare infrastructure. The research report points out that the global market for minimally invasive surgery is expected to show tremendous growth due to rising incidences of surgeries. Minimally invasive surgeries are carried out with a tiny incision to a patient’s body. Small surgical cuts help in faster recovery and reduce the changes of infection in post-recovery period. Minimally invasive surgeries also reduce the hospitalization time and are known to be less painful. All of these factors are expected to propel the growth of the global minimally invasive surgery market. Analysts point out that increasing diagnoses of appendicitis, cancer, kidney stone, arthritis, and cardiovascular diseases (CVDs) amongst others are expected to spike the demand for minimally invasive surgeries in the near future. Growing pool of geriatrics, increasing expenditure on healthcare, and growing awareness about minimally invasive surgeries have also been noted as important components responsible for augmenting the growth of the global market. Shifting inclination toward simpler surgical interventions instead of conventional ways will also prove to be an effective driver for the global minimally invasive surgery market in the near future. On the flipside, the global market for minimally invasive surgery is expected to face some tough challenges. The biggest challenge for the global market is the high cost of surgeries, which makes them unaffordable for many patients. This negative trend has been persistent in the rural parts of the developing countries. Lack of reimbursement and poor diagnosis have also been noted as two factors which will critically restrain the global minimally invasive surgery market. 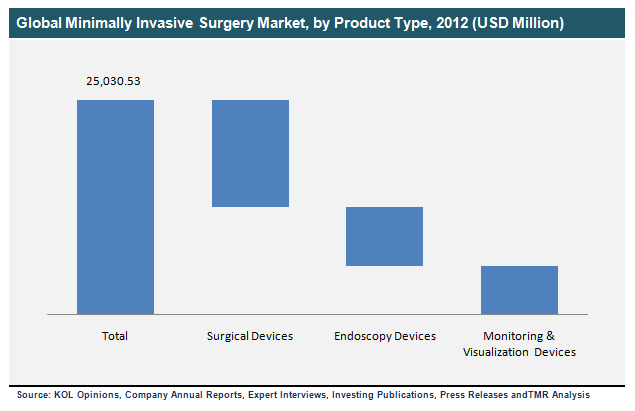 This review is based on Transparency Market Research’s report, titled “Minimally Invasive Surgery Market (Devices - Surgical Devices, Monitoring & Visualization Devices, and Endoscopy Devices; Type of Surgery - Orthopedic, Cosmetic, Breast, Vascular, Thoracic, Gynecological, Bariatric, Cardiac, Gastrointestinal, and Urological) - Global Industry Analysis, Size, Share, Growth, Trends and Forecast, 2013 - 2019”.